Promart opens two new stores in Vadodara. Promart Retail India Pvt Ltd, a multi-brand retail chain, has expanded its presence in Gujarat by opening two new stores in Vadodara. Promart already has one store in Ahmedabad. The two new stores are situated at Seven Seas Mall, Fatehganj, and Aditya Birla More Mall, Manjalpur, and spread across a total area of 2,150 sq ft and 5,100 sq ft respectively. 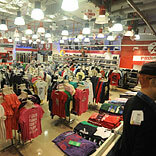 Promart stores offer brands including Arrow, Wrangler, Pepe, Mufti, J Hampstead, Gini and Jony and many more. The stores have an extensive range of apparel, accessories, bed linen, home furnishings, kids’ toys and electronics targeting men, women and kids of all age groups. The products will be available in a price range of Rs 89 to Rs 1,599.